Death toll from the violence in Benshangul region rose to well over 60 based on Voice of America Amharic service report today. The killings happened over the past five days. 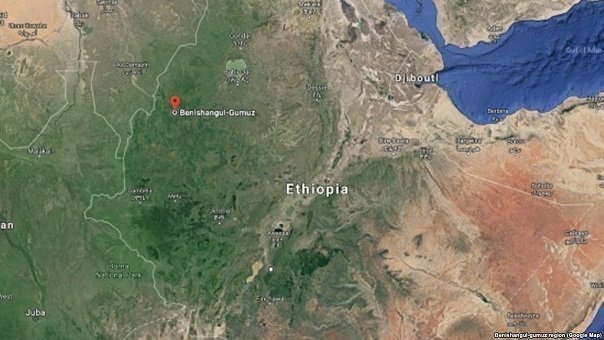 The security crisis in Kamashi Zone of Benshangul region, western Ethiopia, started last week ago after “unidentified” gunmen allegedly hoisting Oromo National Liberation Front (OLF) killed four security authorities of the zone as they were returning from consultative meeting with Oromo region security authorities in Wollega. VOA Amharic cited Takele Tolosa, head of security administration in Easter Wollega region of Ethiopia which is adjacent to Benshangul region, as saying that over 72,000 people are displaced from Bebeloye Jiganfoy district of Kamashi zone due to the violence. BBC Amharic report published today seems to confirm that there was violence in the district mentioned above. The report added that 75 houses are burned down in Bebeloye Jiganfoy district. Abera Bayta is deputy head of Benshangul regional state. While confirming that residents are displaced from Bebeloye Jiganfoy, he says that the number of people displaced due to the violence in the region is “exaggerated,” as reported by VOA Amharic. However, he confirmed that 31 people are killed in the region, seemingly over the course of the past five days. No consensus on the number of displaced people, seemingly. BBC Amharic report cited governing bodies in Benshangul region as saying that people were also displaced from Oromo regional state districts in Wollega that are adjacent to Benshangul region for “fear of violence in the region.” So for these authorities, thousands of displaced people in Nekemete were not entirely from Benshangul region. Critical analysts tend to think that radical Oromo ethno-nationalist group is manufacturing crisis in a way to cause displacement of Oromo speaking people with the objective to alter demography of Oromo speakers in urban centres including in Nekemete, Wellega. Even authorities from Oromo region of Ethiopia claim that a “well armed and organized group” opened fire on civilians and about 23 people are killed. Another 9 people are killed in the town, as reported by VOA Amharic which brings total death toll to 67. In a related development, Oromo Democratic Party, which is governing the Oromo region of Ethiopia, rural political mobilization head Addisu Arega reportedly requested Oromo Liberation Front (OLF) today to order its fighters to enter their designated military camp. His social media statement reportedly caused opposition from radicalized die-hard OLF supporters. On August 28, Prime Minister Abiy Ahmed unveiled a project within the office of the prime minister to demobilize and reintegrate former rebel fighters (of different armed groups including Oromo Liberation Front) to the society. To that effect, he named Tesfaye Yigezu as head of the project. Seemingly, OLF is not observing the terms of the agreement for its return to the country which was meant to be for a “peaceful struggle.” Although OLF has the support of radicalized youth, Ethiopians seem to be weary of Abiy Ahmed’s administration’s hesitation to fully enforce law and order in the country. One Response to "Death toll from Benshangul crisis rose to over 60.Over 60,000 displaced"